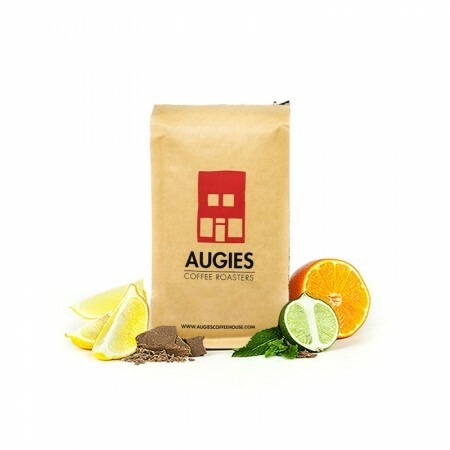 The Guatemala Finca Villaure was carefully roasted for you by Augies Coffee Roasters. This fully washed coffee was grown by Aurelio Villatoro in the Huehuetenango region of Guatemala between 1,800 - 2,000 meters above sea level. I love this coffee. It's a combination of earthy and fruity. It's light with a rich flavor. This coffee is solid. I can honestly say I was surprised by the size of the beans before grinding them. Like mutant coffee beans!! Overall the flavor is solid and is without any unpleasant notes. I definitely taste the caramel notes through especially while the coffee is hot. The citrus finally comes through as it cools. The coffee has a medium mouth feel to it so I don't feel like it tastes super bright. I would classify this coffee as just a good solid coffee. Nothing that will blow your doors off.